Certain optional products are available to Michigan Trial Courts as part of the MiFILE project at discounted prices. The products and their intended purpose is described below. Public Kiosk Workstation – A workstation that allows a walk-in public user to perform a filing into the court. This workstation typically includes a Windows PC and a low-volume document scanner, as described below. Clerk Scanning Over-the-counter – There are certain circumstances where a clerk may need to scan documents directly into the MiFILE system. Two common circumstances are: 1) documents that are received through the mail for incarcerated persons; and 2) documents received over-the-counter for a person that is exempted from e-filing. Court rules and procedures will dictate the conditions under which these options are available. It is recommended that at least a mid-volume scanner be used for this process. 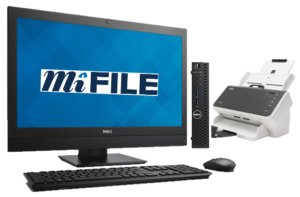 Backfile Case Scanning – If the court is using the Cloud DMS provided within MiFILE, then the court or the clerk’s office may use a scanner to scan existing case records into the Cloud DMS. It is recommended that at least a mid-volume scanner be used for this process. When a court's public records are only available electronically, the court must provide a means for the public to view those records. This may be accomplished by a publicly accessible computer. The court may want to attach a scanner to serve as a kiosk for e-filing. Where possible, a kiosk computer should be placed in an area near the clerk’s counter so that the clerk staff can assist the public in their use of the computer. A Kiosk Computer must be connected to the Internet, but it does not need to have access to the court’s network. The products and pricing contained in this document are valid to Michigan Trial Courts. Components ordered from this site must be shipped directly to a Michigan Trial Court address. ImageSoft accepts purchase orders with net 30-day payment terms directly from Michigan Trial Courts for the components contained in this document. If you are a Michigan Trial Court you may be entitled to purchase directly from this schedule without performing an RFP (check with your local purchasing department). Products can be purchased by providing a purchase order. Visit the MiFILE Pricing Page for current pricing.